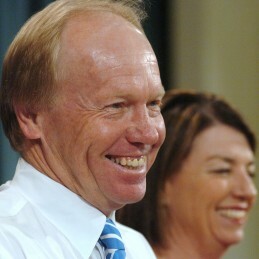 Peter Beattie, AC served as the 36th Premier of Queensland from 1998 to 2007 and Leader of the Australian Labor Party in that state from 1996 to 2007. His sweeping victories in the 2001, 2004 and 2006 state elections confirmed him as one of the most electorally successful politicians in Australia. He retired electorally undefeated in 2007. In his later years he groomed and was then succeeded by his Deputy Anna Bligh, who became the first female Premier of Queensland. Beattie then served as Queensland’s Trade Commissioner to North and South America based in Los Angeles. Peter moved to Clemson University in South Carolina for a year, he then served as Australia’s first Resources Sector Supplier Envoy charged with promoting a Buy Australian at Home and Abroad program for supplying products to the Australian resources industry. He returned to Australia to unsuccessfully contest the 2013 Federal election.